The box is tongue and grove. So its a old box. I am trying to place a face value and history. I can't find a way to post a picture. If anyone can help me out, I would really appreciate it. Don't know a thing, but Coke is spelled Coca Cola, not Coco Cola. I can't find a way to post a picture. upload the image to a free hosting site like photobucket. Morning here is a link to the exact same box that I have. I search high and low to find information on this, with no luck. Here is the link...Thanks for the reply. Not the ones repro'd in China! This is a link to a website that specialises in coke memorabilia. 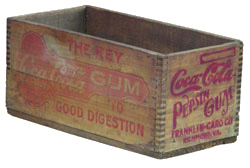 I've not trawled through everything, but they did have a wooden box similar to yours on page 1, it held bottles, not gum. If you want to know how much it sold for you have to sign in, and I don't want to do that, it's not my box.